The Greek deity Zeus lusted after the beautiful maiden Europa, the daughter of Telephassa and Agenor (the king of Phoenicia). One morning, she and other maidens went to pick flowers in the meadow by the sea. Zeus wanted her so badly, he disguised himself as a beautiful, innocent looking white bull, and roamed the meadow where the women lingered. Europa soon noticed Bull's presence and approached him. She admired his beauty and gentleness, and on a whim mounted him. Zeus, the Bull, leaped up and carried her over 600 miles across the water to the Island of Crete in the Mediterranean Sea. There she became the mother of King Minos of Crete, King Rhadamanthus of the Cyclades Islands, and Prince Sarpedon of Lycia. Another story about Taurus involves the seven daughters of Atlas, or in other versions, Pleione. The great hunter Orion took more than a passing interest in them. Atlas felt a rather old fashioned concern for his daughters, and asked Zeus to protect them. Zeus transformed the seven sisters into doves and placed them in the sky. When Orion followed them, Zeus placed a large bull between him and the seven new stars. 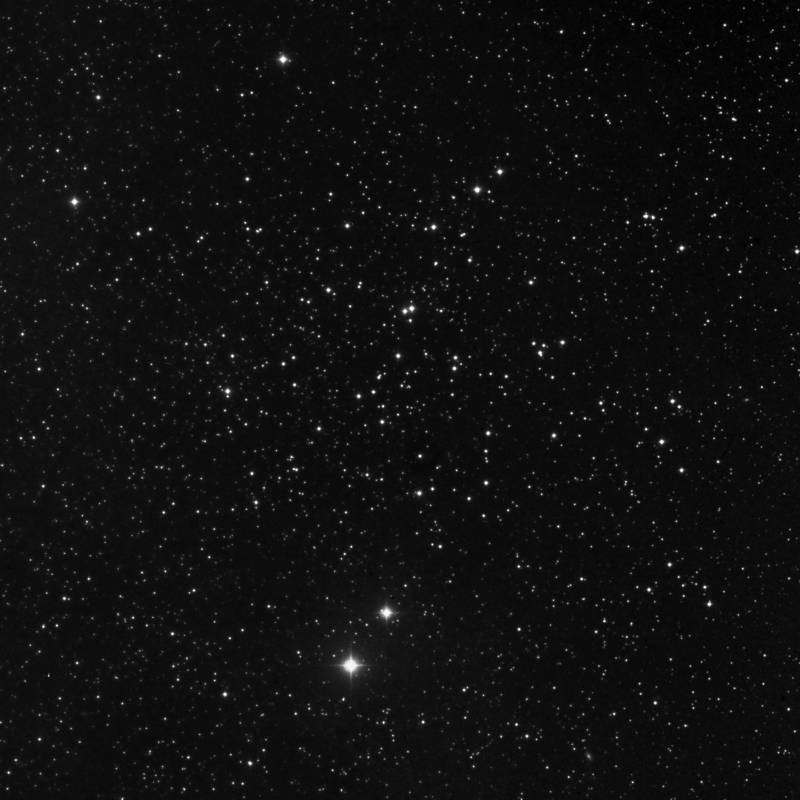 58k JPEG NGC1647 is an open cluster located 3.5° north-east of Aldebaran (Alpha Tauri). Dreyer calls it very large (40'), fairly bright (mag. 6.4), with about 25 stars between mags. 8-13. Binoculars just begin to resolve this cluster. Very pretty in a low power field. Two stars, one bright (mag.6) orange (SAO 94112), the other not so bright (mag. 7.8) an orange (SAO 94110), sit at the southern edge, giving a nice contrast. Image from the Digital Sky Survey. NGC1514 is a planetary nebula located 1.8° NNE of Psi Tauri on the Perseus border. The HAS map locates it in Perseus, but that appears to be an error of TheSky, which placed the boundary a little too far south. Central star is mag. 9.1, while the nebulosity extends over 3', and shines at a dim mag. 11. A description by Eric Greene: "This seems to be one of the least observed of the large, bright planetary nebulae. It is very large and ring shaped around a mag 10 star. I spent a long time looking for it before finally spotting it at the Blue Ridge Parkway star gaze in 1989. I kept walking over the planetary without seeing it since it was so large. Look for 3 mag 10 stars in a line across your field of view and the nebula is around the middle star. While easy in really dark skies, it becomes a much more difficult object with light pollution or haze. A UHC or O-III filter and around 110 pop it easily into view." Sketch by Scott Davis. M1 (NGC1952) is a patch of nebulosity from a supernova explosion observed in 1054 C.E. (formerly A.D.). You can find it by aiming 1.2° NW of Zeta Tauri. Shining at mag 8.4, and covering 6' of the sky, Dreyer calls it "very bright." Dreyer was a tad optimistic. It is somewhat elongated in position angle 135°. 41k GIF. The Crab Nebula is shown in a three-color reconstruction from BVR CCD images taken in 1993 with the 1.1m Hall telescope at Lowell Observatory. More images can be found at the University of Alabama Web site. 51k GIF. Image of M1 taken by George Sallit from Reading England with a Hi-SIS 22 CCD camera on a 12" Meade SCT. Seven exposures of 200s each were combined with an SMEDIAN function using MiPS software. Exposures were in 2x2 binning mode. 26k GIF Caldwell 41 (Hyades), a large, loose, V shaped open cluster, located by Aldebaran (Alpha Tauri), is best seen in binoculars. The "image" is a detailed map. Stars include both Bayer Greek letters and Flamsteed numbers. Click here for a printable version of the detailed map. 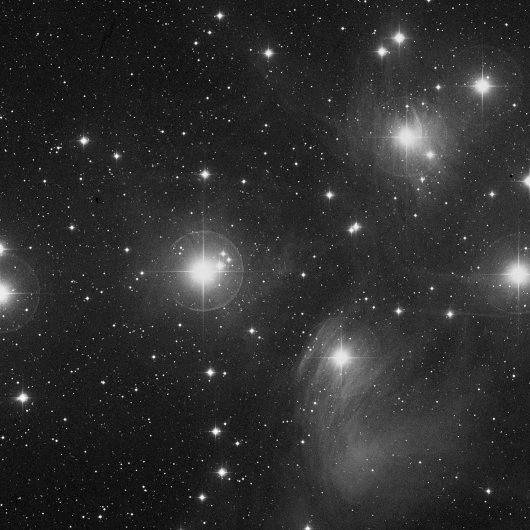 Bill Arnett's map of M45, the Pleiades. This is an open cluster of stars, located in NW Taurus, some of whose members are visible to the naked eye. A finder scope, or binoculars does best with this object. Many photos, like this one, show blue reflection nebulosity around some of the stars, most prominently near Merope. Many people have claimed to see these faint wisps in their own telescope. Such claims should be taken with a slight grain of salt. The stars shine brilliantly and accent any dew on the eyepiece. 47k JPEG. Image from the Digital Sky Survey. Click here for a 166k JPEG.